The best lacrosse players in the world all have the highest level of stick skills in the game. In order for them to perform at the elite level they have their sticks strung to meet their needs as a stick handler. Each player has their own unique style that requires a specialized pocket for them to play. Even different positions on field may require a certain style stringing that allows the player to more effective. 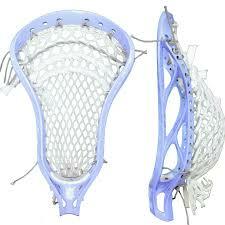 The ultimate goal for lacrosse players is to find a stringing that is best for them. A stick that passes/shoots accurate and has a the right amount of hold in it for cradling. Our coaching staff has years of experience in the field of stick stringing and will ensure that each pocket is custom to the players needs. You'll be amazed at how much better one may be with a properly strung stick. Please contact Ryan Burton with all stick stringing inquires.